Ever since the TouchPad was released people have been looking for a solution to their Evernote woes, what with the fact that Evernote never created an app for the TouchPad and more recently that the app for phones was broken by a change on the Evernote servers. In swoops MeOrg!, a SpringPad client made by Sven Ziegler. SpringPad is a service not dissimilar to Evernote in that they both pretty much do the same thing, with many even preferring SpringPad over Evernote, but can MeOrg! stand up to the task? The initial setup of MeOrg! is pretty simple; you can login to your account if you've already created an account or you can create a new account by tapping on the appropriate button, which loads up the SpringPad website in the browser. One thing that annoys me a bit, not limited to MeOrg! but a general user experience problem throughout many webOS apps, is that you must actually tap the login button to log in instead of just hitting the return key. Another thing that is a small bit annoying is that the username input field isn't set up to use the email keyboard by default even though in my case my username is my email address. Once you enter the correct credentials and log in, you're prompted to import your Evernote or Google Note information if you want to. Finally, after you've finished logging in and importing your information you're brought to the main app screen - but wait, it doesn't automatically sync your SpringPad notes into the app, so you have to do that manually. I would prefer this to happen as soon as I log in because, well, why should I have to manually sync it on first use? In the main app screen, you're presented with the traditional sliding pane layout with your notes on the left and the details view on the right. Something that immediately stands out to me is that the search box is rounded when it would look better and a little less off if it had box-y corners. Another thing that sticks out are the toolbar icons - they do take a bit of getting used to in order to understand what each one does, however the developer thought enough about this to include a description of each icon in the help popup which can be opened from the app menu. Obviously a big part of SpringPad - and MeOrg! - is content consumption. You made the bookmarks, lists, or whatever else so you can look at it later. The app implements this well for many "objects" in SpringPad like lists and recipes, however there are some shortfalls with other objects like bookmarks. I would prefer that MeOrg! have an in-app browser for bookmarks, perhaps included in the large whitespace where the current source link is located. Of course, not everybody will have this same preference, so this would be best implemented as an optional feature. MeOrg! includes a large selection of services to share through - email, messaging, PDF creation, Facebook, Twitter, and Google+. 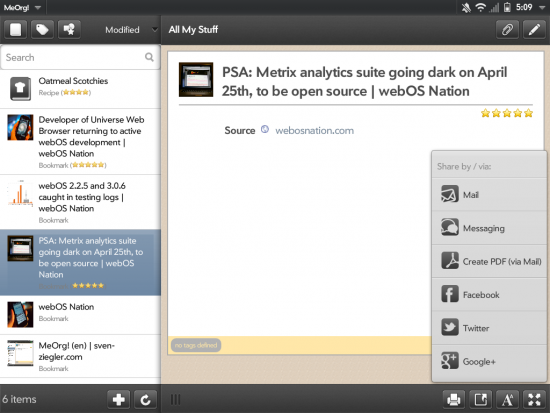 There are a couple of areas that could be easily improved; for example, sharing via Twitter opens it up in the browser, same as Facebook, while most Twitter clients and the "official" Facebook apps for webOS all support cross-app launching. For people who don't visit the Twitter or Facebook websites on their webOS devices, such as myself, this is one of the areas most in need of an improvement. MeOrg! isn't just for content consumption, it's also made content creation. Adding something in MeOrg! 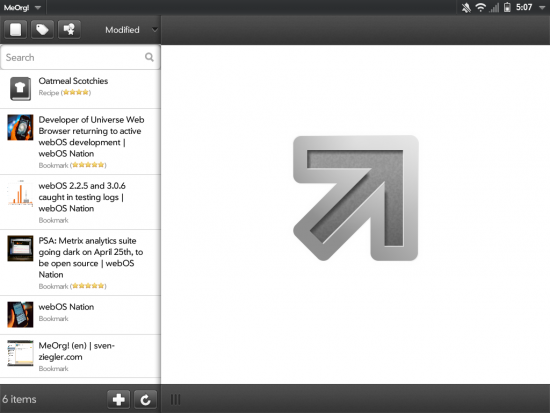 opens up a large popup which feels really out of place in webOS. It would be more natural to have a new pane show up, similar to how the email app works, and I would really prefer this over the current implementation. That's not to say it's broken in any way, it just doesn't really flow. With MeOrg! 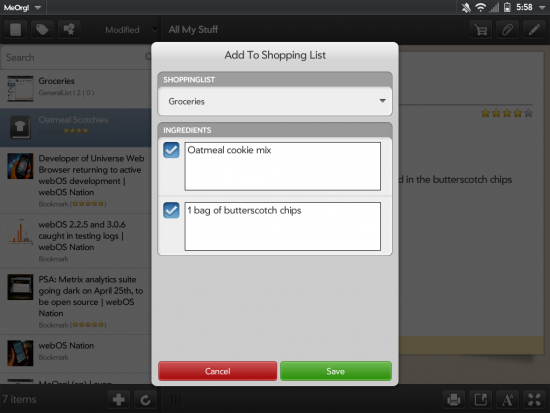 and SpringPad you can create shopping lists, although that's more fitted for use if you're using MeOrg! 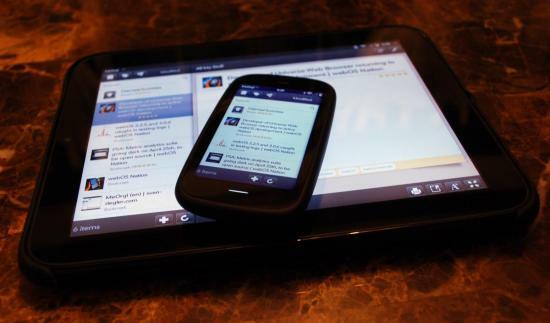 on your phone than your tablet, given that the TouchPad isn't exacly a device sized for use at a grocery store. You are not limited to just shopping lists, you can create any type of list, as well as task sheets, recipes, appointments, reminders, and notes. The developer even added in some integration between recipes and lists, allowing you to quickly and easily add your recipe ingredients to any list you've created, which works well when you're doing your weekly shopping trip and have to pick up the ingredients to make seven different dinners. Overall, MeOrg! looks pretty good and has some well-built share capabilities, however there are some issues with it too. Most are just little things that annoy me but may not be an issue for another user. There are some questionable design choices and, more importantly, some questionable user experience decisions. At $2.99 though, MeOrg! is an app you really must buy if you use SpringPad or are an Evernote user looking to move over to another service. 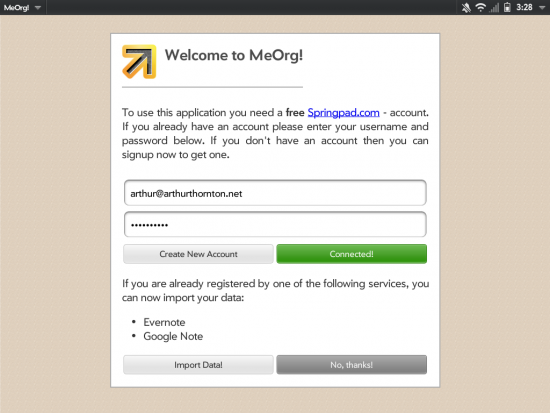 If you currently do not use any service like Evernote or SpringPad but are thinking about it, you can't go wrong buying MeOrg! With a couple of updates, this app will be pretty much perfect. For now though, I would have to say MeOrg! is around 4 out of 5 stars.